Return to Prambanan and Borobudur 22 years later. This was my second trip to Yogyakarta, an ancient town in central Java, 22 years after visiting with Bill in 1988. The reason to go there is to see two contemporary sets of ruins, built in the 9th Century, in different directions outside the city. Borobudur is more famous, and celebrates Lord Buddha in a single massive stone pyramid near the smoking cone of Merapi. Prambanan is just as beautiful, and sings the praises of Hindu gods, including Shiva, Vishnu, Brahma and a thousand other lesser knowns. Adjacent ancient Java dynasties built these competing temples within a few decades of each other, celebrating competing religions before the arrival of Mohammed. Both have survived Muslim iconoclasts, earthquakes and volcanic eruptions, and been restored many times since they were built. I went back because I loved them the first time, and wanted to photograph them again with a better camera. I also wanted an excuse to stay in that wonderful hotel in nearby Surabaya called the Majapahit, and the almost as good Phoenix in Yogya. Both are old colonial piles with atmosphere and Somerset Maugham connections, and it was convenient and fun to take a train between them through the rice fields of east Java. 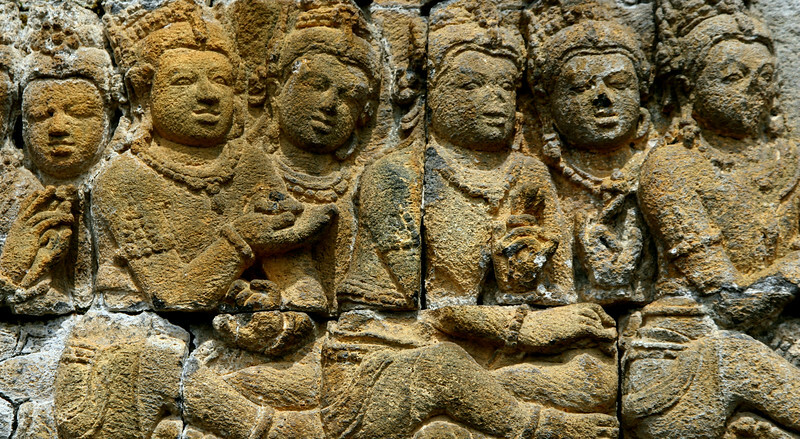 Buddhist vision of the cosmos at Borobudur.